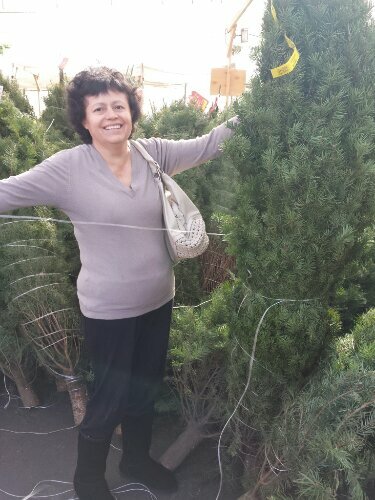 My mom and I bought a Tree today. We love decorating for the holidays, we were both really excited. Now that’s good Christmas spirit! First off, let me start by mentioning I absolutely looovvvvee Christmas. It is my favorite holiday off all time. I don’t know what it is, it might be the lights, decorations, the music, the food, my tradition of attending midnight mass or even the mistletoe. It can be all of these things or some more then others but the entire idea of Christmas brings me peace and happiness and the excitment to build more memories. There has only been two Christmas e’s when I’ve ever felt sad, and that was Christmas 2010 and last Christmas in 2012. Last December we had just found out that my mother had Lung Cancer Stage four and I was wounded with the terrible news. As much as I smiled and showed everyone I was okay, like I always do with any situation… I was hurting. I was mad at god, that I didn’t attend midnight mass. I was worried and so afraid that this might be my last Christmas with my best friend. Now a year has gone by, and thank god she’s still by our side. She looks so healthy and she’s fighting strong. This brings me all the christmas joy I need. I know its not forever and no matter who is sick or not tomorrow is still never promised to any of us. However, what I do know is, I am so grateful to have my family here today. I pray tonight to have them again tomorrow by my side and for many more years to come.